OmegaCEN is the expertise center for data-intensive astronomy and astronomical information technology at the Kapteyn Astronomical Institute at the University of Groningen. The center designs, builds and operates advanced survey data handling systems for astronomical instruments, such as ESO's Euclid space mission, the MICADO near-infrared imager for ESO's Extremely Large Telescope, the MUSE integral field spectrograph at ESO's Very Large Telescope and the OmegaCAM wide-field imager at the VLT Survey Telesope (VST). OmegaCEN started as an initiative of the research school NOVA and continues to support NOVA's instrumentation programme. In addition to the support by the Nederlandse Onderzoekschool voor Astronomie (NOVA), OmegaCEN receives support from the Kapteyn Astronomical Institute and the University of Groningen. The EU: OmegaCEN is coordinator of the EU FP5 Research and technical development (RTD) programme, Astro-WISE, which connects various national wide-field imaging data centers in Europe. Astro-WISE is installed and running. The programme continues and is expanded to support more facilties and projects, see brochure October 2007.
partner in the EU Research Technical Network (RTN) SISCO. partner in the Euro-VO Data centre alliance, and the EURO-VO-AIDA programme, a collaboration of various National virtual observatory organizations to promote the connection of national astronomical archives to the European Virtual Observatory network. Here is the OmegaCEN Tri-Annual Report 2013-2015. 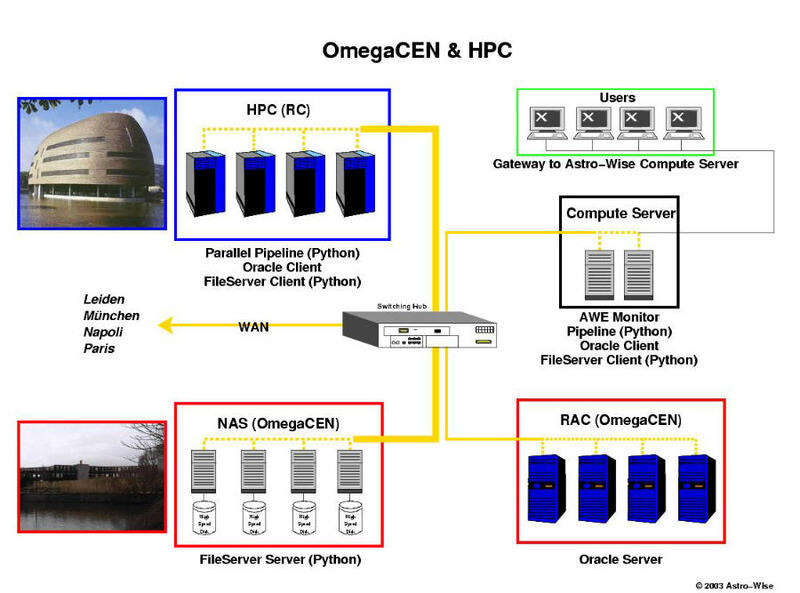 OmegaCEN hardware is characterized by full scalability; scalable parallel processing, scalable Tbyte direct access, and scalable Oracle Real Application Cluster.